What Are Some Common Causes of Roof Damage? No roof shingles are invincible, although some types appear to be close. Take a look at your roof in Redmond every now and then and see if everything looks normal. Notice any problems with the flashing, shingles, or gutter system, and talk to a roof repair specialist to see what you can do about them. The roof that covers your house will spend the entirety of its working life outdoors, which means it’ll be vulnerable to elements like rain and snow, as well as pests and the nests they create. Regular maintenance is key if you want your roof to last for as long as possible. Here’s what you should know about some common causes of roof damage. Your roof takes on the elements so that you don’t have to, so it’s only fair that you return the favor by repairing it when it’s been damaged. Water, snow, hail, and sleet will all take a toll on your roof. Those who live in climates where hurricanes are prevalent will have to pay even closer attention to their roofing systems, as wind can be a real threat as well. Severe weather can rip up your roof shingles and potentially even tear your whole roof off of the top of the house. Critters like rats and mice can squeeze through holes and crevices the size of a dime, and ants and termites can go virtually wherever they want to. 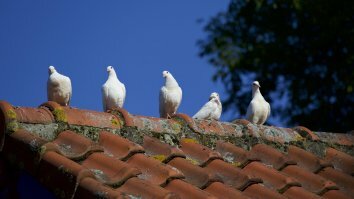 When it comes to roof damage, the pests you should be concerned about are birds, squirrels, and rats. These animals will have no trouble making their way up your siding or through your gutters, and they may ultimately decide to nest on your roof. This gives them an outpost, so they can take their time in burrowing through your roofing shingles and into your home.